The Kakla to Shimla Railway was opened at the turn of the 20th century to allow the colonial families of the Raj to escape the summer heat of Delhi and Calcutta for the cool mountain climate of the hill station at Shimla. The narrow gauge track takes a meandering route for 96km as it rises over 1,600 metres, passing through 103 tunnels amidst some stunning scenery. The Darjeeling Himalayan Railway was completed in 1881 and connects the hill station of Darjeeling with the low-lying plains of Bihar. Its tiny locomotive travels slowly along a narrow gauge rail, taking 8 hours to complete a mere 82km on a meandering route. The railway highlights the ingenious engineering required to lay track along the mountainous and jungle clad landscape. The scenery changes from paddy fields through hills filled with tea plantations and finally reaches the mountain slopes of Darjeeling, with stunning views of the Himalayas beyond. The Nilgiri Mountain Railway is a narrow gauge railway built at the turn of the 20th century to connect the British hill station of Ootacamund to the plains below. The track scales an elevation from 326 metres to 2,203 metres through the scenic Nilgiri Hills. Ootacamund, known as Ooty, is the most famous of South India's hill stations - its attractions include the Botanical Gardens and the stunning views from Dodabetta Peak. Kaleidoscopic sights of this colourful country take your breath away. 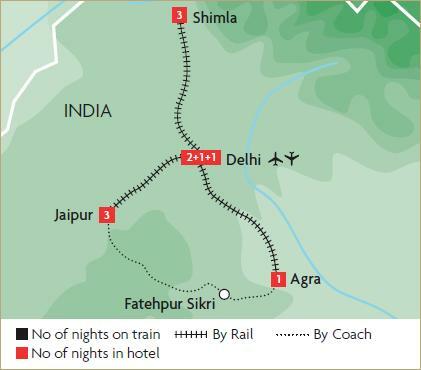 Our India�rail tour takes in the Red and Amber Forts, temples, beautiful palaces and ornate gardens, as we visit Delhi, the pink city of Jaipur and Agra with its white marble icon.